CleanTechnica recently surveyed its readers on their two-wheel electric vehicle desires and plans. If you haven’t responded yet, you still can, but here are the interim findings. This survey data is part of the upcoming CleanTechnica report on disruption and innovation in the motorized two-wheel vehicle space being worked on by Susanna Schick, Nicolas Zart, Kyle Field, the CT team, and myself. The survey on motorized two-wheelers is a key piece of market information which will assist manufacturers, urban planners, and entrepreneurs with the right products and responses globally. Articles in the series leading to the report have included the innovative disruption facing the space from electric-assist bicycles, the challenges facing major motorcycle firms such as BMW and Harley-Davidson, the different issues facing startups such as Zero and Alta, the unexpected impacts that are emerging, what’s driving the transition, and the prevalence of retro design in the space. First, let’s look at who has responded so far. The second and third part of this analysis will be published shortly, and will look at what respondents were interested in and what their buying intentions were. 465 people responded. Per SurveyMonkey, this means that the results are solid, with +-5% confidence for large populations. 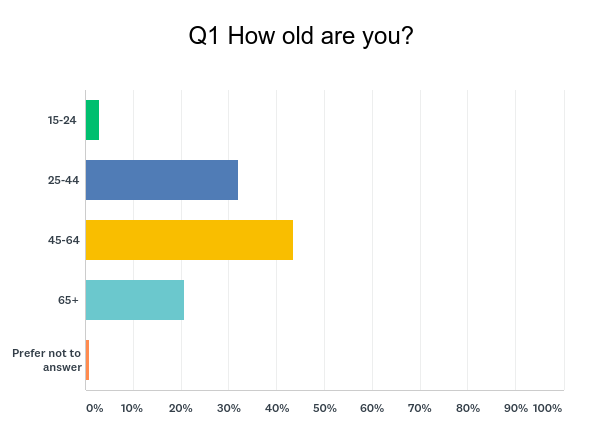 Understandably, however, the results must be put in context of people who elect to read a cleantech online journal and the following demographic survey results. Respondents to the survey skewed somewhat older than average for North America and quite a bit older for the globe. Respondents were over 90% male. Stereotypes confirmed? The country chart has been cropped to only show the top 10 countries of respondents. CleanTechnica is an English-only publication with a tendency to focus on North America, so the skew to the USA and Canada is understandable, as are the presence of 4 more English-language countries in the top 10. The prevalence of cycling and e-bikes in Europe likely accounts for the non-English-language European countries, although Switzerland does have English as one of its official languages of course. The lack of any response from Japan and China, major e-bike markets, is unsurprising given language barriers, but unfortunate from a results perspective. Part of the hypothesis we are testing regarding disruption in the two-wheel motorized vehicle space is the increasing shift of people from rural to urban areas. Some respondents commented that they felt the division was less clear and would have preferred a greater breakdown of these demographics, but the premise being explored was whether people who identified as living in cities would have a greater preference for e-bikes. The secondary premise was that younger generations would be more likely to live in cities and have a greater preference. Given the prevalence of North American responses, the ratio of city to rural dwellers is high. A 2016 US Census report found that while rural areas covered 97% of the area of the country, they only contained 19.3% of the populace. Urban areas are defined by the US Census Bureau as “contiguous census block groups with a population density of at least 1,000/sq mi (390/km2) with any census block groups around this core having a density of at least 500/sq mi (190/km2).” That definition encompasses a lot of what people think of as towns and even small towns, so the CleanTechnica survey choice was to pick ‘city’ vs rural. This is distinguished from the Census Bureau’s stricter use of ‘urbanized area’, which is what most people would think of as a city. And what is allowed to call itself as a city varies widely globally as well, with Japan starting at 30,000 and the UK starting at 300,000. Given the dominance of North American responses, most people will be responding with city if they live in urban areas with over 100,000 population. Further, the cities will be less dense on average than European and Asian cities of equivalent populations. Cities in the USA can self-identify down to fairly small populations, and when only places that have officially called themselves cities or are incorporated areas are counted, only 62.5% of US citizens live in cities. That’s still higher than the likely response breakdown of people responding about whether they live in a city. Some incorporated areas calling themselves ‘city’ have a populace of 1,000, but the citizens don’t think their town is a city. All this is to say that the CleanTechnica audience, with 72.94% self-identifying as living in a city, are much more urban than average for North America. Unsurprisingly, CleanTechnica readers skew heavily to greater incomes than average. Here’s a 2013 US Census chart of household income for comparison. 54% of CleanTechnica respondents reported personal incomes above the median household income for the USA. 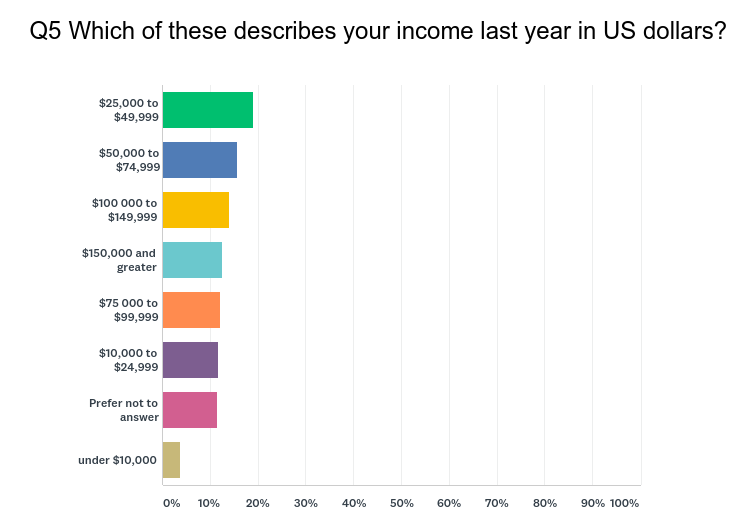 While the top 10% started with household incomes of $135,000-140,000, a full 12.5% of CleanTechnica respondents reported personal incomes in excess of $150,000. Much of this is accounted for by the respondents being male and older, two aspects which correlate strongly with greater incomes. From a marketing perspective, readers of CleanTechnica interested in electrified two-wheelers have quite a bit more money than average. So that’s who responded. Older, male, wealthier, and in North America for the most part. Strongly identifying as city dwellers, not rural dwellers. Not a surprising response, but a useful one as we move forward into looking at what they think of motorized two-wheelers, what they want to buy, what they would spend, and whether they intend to spend the money. That’s the next article.